“she is getting better.” that statement is confusing and continues to be a process for me. some of the family, most people, the doctors, the therapists see “better” as moving towards “normal” and seem to be moving on with their own lives. which is apparently normal. and better. thanksgiving afternoon she said, “nothing really matters anymore. i don’t know how much longer i have here, but it really doesn’t matter.” she is not depressed; her words just come from an honest space. she is childlike, has no filter, calls it like she sees it and understands that most people are not able to take time to listen to her or understand her. she cannot read, walk by herself, drive, have her dog, cook, make her own tea or work the stereo; she doesn’t know what to do with her phone or iPad and she has never watched much TV. she cannot knit or create. those things she did to fill her time before the stroke are just not possible anymore. she always read before she went to sleep. now she just lays there. in the morning she wanders around their home, waiting for someone to wake up. sometimes she puts a single pair of socks in the washing machine or cleans the sink or washes toothbrushes. some people visit and talk at her because they are nervous or don’t know what to say or are afraid and think that she is “normal”; she is getting better. but, she just can’t keep up, she can’t talk in full sentences, she gets overwhelmed. she cannot explain or talk unless someone takes the time to wait for each word, each meaning, each nuance. I feel profoundly sad….for her (although, she does seems content), for those that are missing out on being with the new her, and for myself. I never thought I would write those words. how old are we anyway? seriously, something just doesn’t feel right. things don’t add up. slippery and muddy and covered over with words used as spiritual protection and knowledge and jockeying for position in an environment of equality. again, seriously, this all sounds so childish in the grand scheme of life and death. why in the world would anyone need to speak poorly of others? why not just speak from the heart, say what you mean, and live, really live what your faith professes. simple. talk to one another. speak the truth. let go. breathe. breathe in. breathe out. we don’t really own anything anyway and we definitely don’t own other people. Sounds a bit like dementia? Like the process of Alzheimers? Possibly like caregiving? November is Alzheimer’s month. It is a time to remember, to name names, to acknowledge and recognize those people we have known, those we have loved, those who are with us, and those who have died. I am going to use the words from the Beatitudes in the New Testament. But I want to clarify some of the words because I do not want to imply that anyone is lucky, or fortunate or chosen with the diagnosis of Alzheimers or Dementia. I want to invite you to remember the grace and the impact that a life has had on the world. The life of your loved one, your family member, the one in your care. The one you will name today. They are and were not an empty shell. They are, and continue to be part of your story, your life, your relationship. They will remain with you as long as you continue to speak their story and the influence they have had on you. Blessed is another word for Grace. And Grace is another word for honor, to dignify and being in favor with God. Favor is a kindness, a service and a leaning into a calling. Being created in God’s image implies that each person has a completeness to their essence, their being, a wholeness of mind, body and spirit. The person with Alzheimers has a wholeness to their essence. But like in the autumn mist, we are not able to embrace them. Created in God’s image also implies that every individual is created for relationship ­with God and with others. But like in the autumn mist, the edges are softened and connection is not the same. Every individual maintains an ability to give and to receive. Like in the autumn mist, the harsh landscape is touched with moments of quiet grace. The meek, the defenseless, the vulnerable, the powerless, the poor in spirit, the ones who mourn are called blessed ~ remember, blessed is another word for Grace, another word for honor, for being in free favor with God. Blessed are those who have a story that needs to be heard. Blessed are those who hold, who listen, who feed, who love. Blessed are those who are loved. Blessed are those who remember. Blessed are those who have forgotten. Blessed are those with bodies and minds and spirits. Blessed are those who need affirmation, support and connection. This is what Love is. This is who God is. May the Wellspring of Compassion be opened in you. May soothing words find a home in you. to comfort body, mind and spirit. In the midst of fear and frustration may Courage be given you. May Patience keep vigil with you and Peace of Mind calm you. May your heart find a song to sing even when you are weary. as you live the mission of Care entrusted to you. the stroke of midnight. a stroke of luck. a stroke of brilliance. the stroke of a tennis racket. stroke a golf club. backstroke. stroke a child’s head or the long back of a sturdy horse. ischemic brain stroke. traumatic brain injury. what the hell is a stroke? a sweeping movement of beauty or a life-altering moment, impacting time, relationships, understanding, functionality? in slow motion, everything happened at once. my mother, the woman who could walk off a migraine, was taken down. she can’t remember what she had for breakfast as she puts her arthritic, bent fingers together to describe “only a little bit.” she cannot find so many words; she has lost them somewhere in her mind. she knows what she is saying, but the words are unintelligible. her frustration turns to tears, to giggles, to anger. there is no telling what will come out. i see only the struggle that is battling in her brain. i feel the laughter in my own body, and i hold her tears as holy water. we sat with a book that christine had given me. “who is christine?” slowly we follow the thread of memory backwards to the feelings of love and connection she has with the abbess. ah, yes. “she loves me. oh, i do love her.” simple. it is enough memory to move forward. a book of angels. i ask if she has been aware of an angel. she puts the book down, ponders, searches for words and tells me there was an angel with her. maybe she meant at the hospital. maybe early, as a child. maybe she meant today or yesterday or years ago. but, yes, there was the presence of an angel. 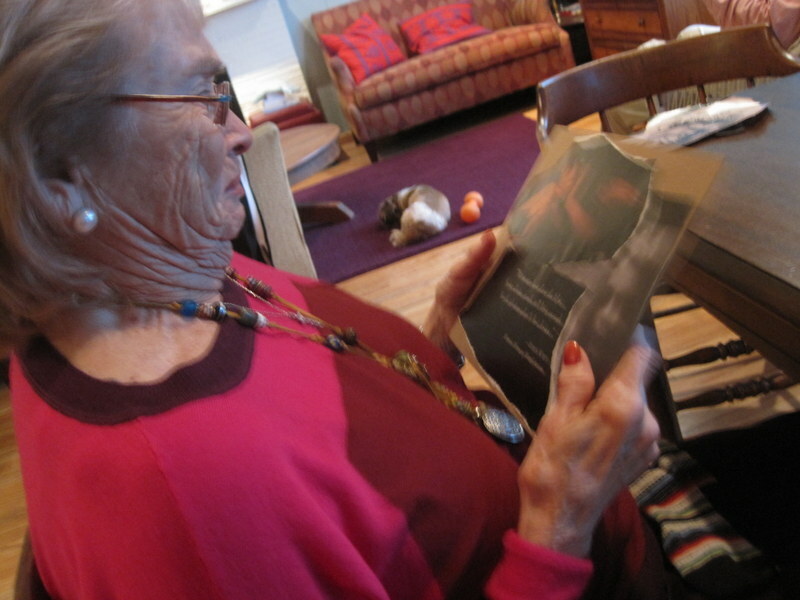 she examined each page, touching, stroking faces and feet and eyes, connecting her own face, her own feet, her own eyes. seeing herself in the pictures, seeing the angel within, recognizing something sacred. 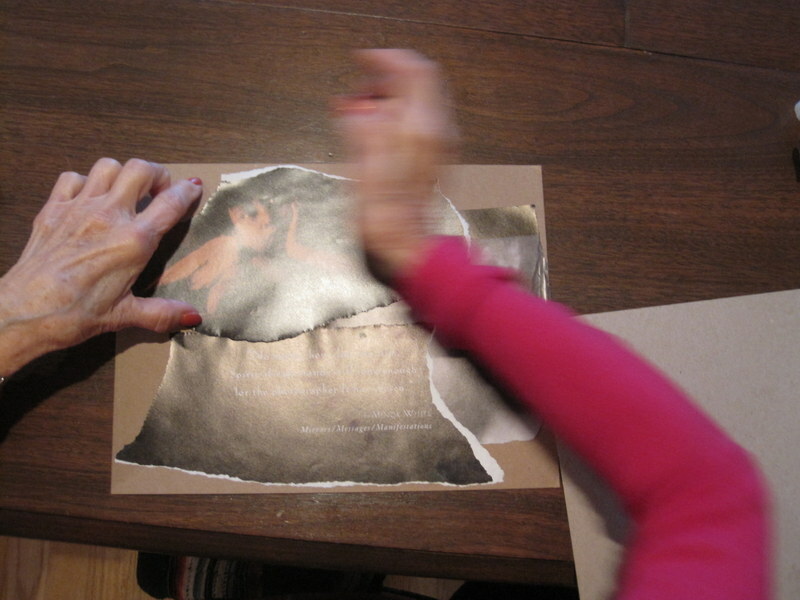 she carefully and excitedly ripped pictures out of a huge book. “are you sure this is OK?” seven pictures were torn out, each individually kissed, held to her heart and tear-stained. 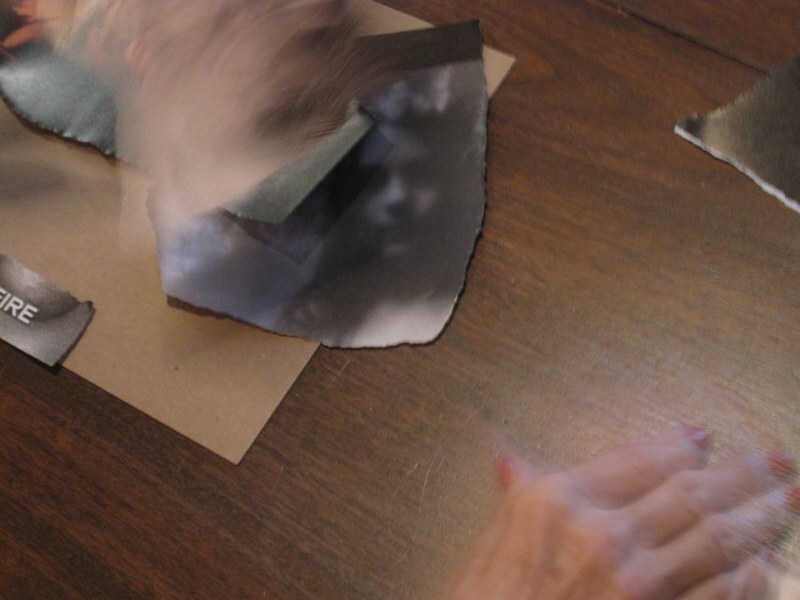 she carefully moved three images around her paper to just the right spot. oh, what to do with a glue stick. 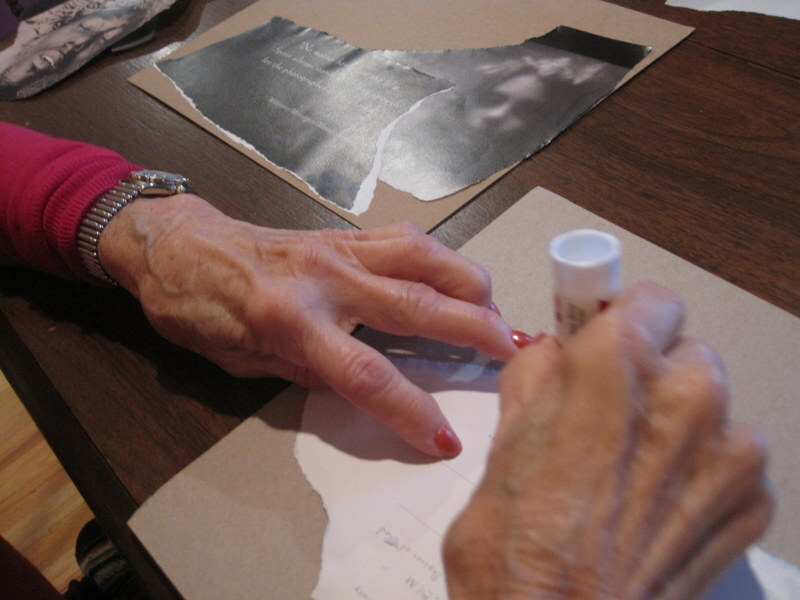 like a child, she unscrewed the top and smeared the back of the photographs with glue. 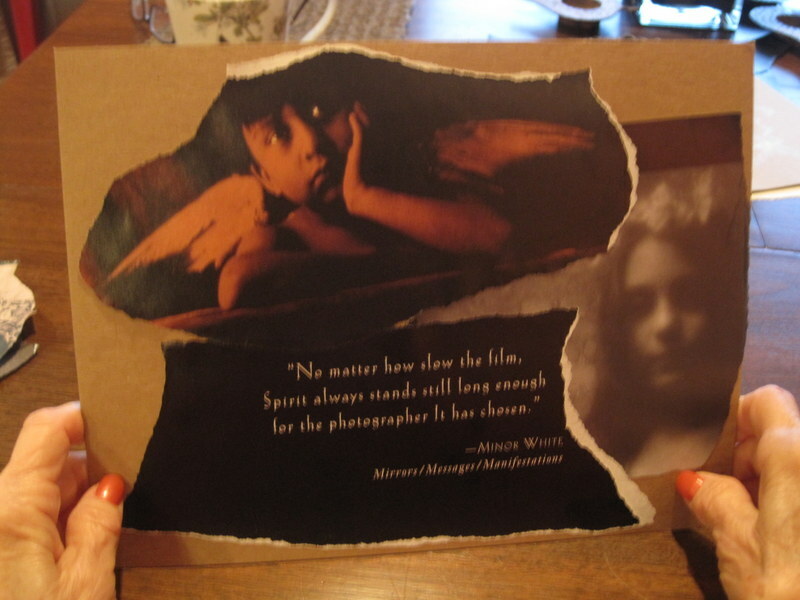 deep, deep breaths as she viscerally encountered the three pictures in a new form and she saw them as whole, as a story, as part of her angel experience. few words were exchanged. no questions were asked. we just were. we were together in a place that did not require explanation or description. She allowed herself to be in the moment, in her spirit, to let her spirit remember. she needs to do all the work, such hard work. speech therapy. occupational therapy. doctors appointments and hair appointments and nail appointments and four-mile walks by the river and constant visits from family and friends. thinking and practicing and repeating. over and over and over. her brain, the bruised and deadened part, is tired. she is trying so hard to “be” better and “do”what needs to be done to speed he recovery. yet she needs tending time. time to rest and allow her body to heal. she needs time to soothe her soul. time to sing “How Great Thou Art” and “Beautiful Savior” even without the words. this is the time for her to learn to embody the deep, vast love of her God and her family and friends. this is the time for her soul to be nurtured. not with running around, but with breathing and visualizing, remembering and knowing her place in the world as Elder, as Crone, as Grandmother, as Sophia wisdom. She found that with the angels yesterday.